The first choice is the main program itself — and that will be the number-one selection on your hit parade in days to come. The second choice is the authorization stuff you probably went through when you installed the program. 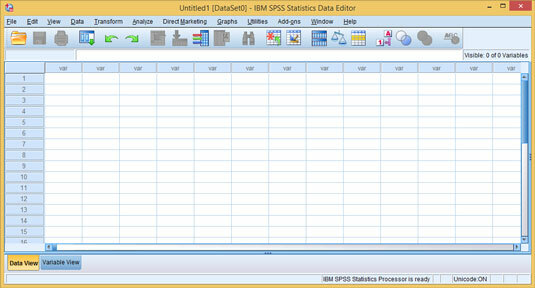 When you first start SPSS, you see a dialog box like the one shown here. This dialog box lets you go directly to the window you want to work with. 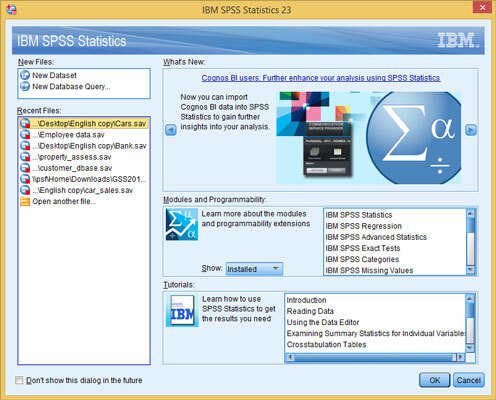 The problem is that it assumes you already know what you want to do, but you have no idea what you want to do with SPSS yet, so just click the Cancel button to close the dialog box. You can go directly to the function you want to perform. You see the regular Data Editor window. If you’ve ever worked with a spreadsheet, this display should look familiar, and it works much the same way. This window is the one you use to enter data. Expand the window to fill the entire screen because more spaces are displayed at one time. The window used to enter and view data.